Shortly after Google began to roll out Android 7.0 Nougat update on its smartphones Nexus (still compatible), manufacturers have begun to announce the roadmap to perform the update to the new software for their cell phones. It has been several months since then and it seems that finally Xiaomi not want to stay behind in the race. Although the Chinese mobile phone maker still has not officially announced plans to update to Android 7.0 Nougat, the company may have started working to make it happen. 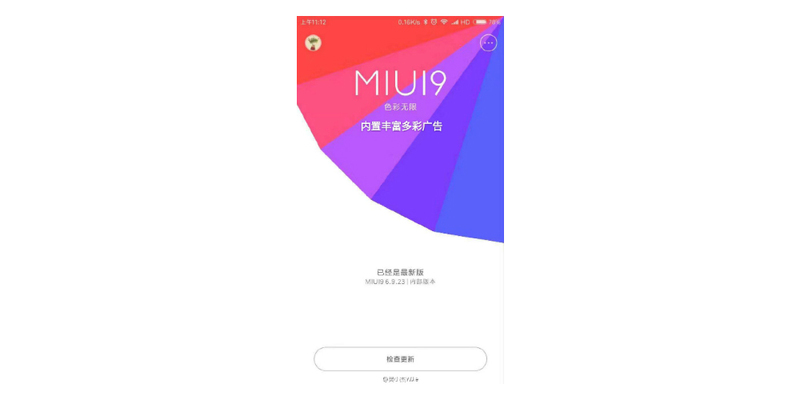 An alleged screenshot of MIUI 9 appeared in Weibo, and is expected to be based on Android 7.0 Nougat. This screenshot does not reveal many features about it, but it does show the version number (9.6.23) that would confirm it. Furthermore, in a post of the MIUI forums, an user shown a list of devices that will be updated to MIUI 9. This lista includes devices such as the popular Redmi 2 Prime, Redmi Note 3, Redmi 3S, Redmi 3A, Redmi 3, Xiaomi Mi 4c, Mi 4i and Mi 4s. The list also includes the latest flagship smartphone, the Xiaomi Mi 5 released this year, and the Mi Pad 2, Mi Note and Mi Max. Other cell phones like the Mi 5s and Mi 5s Plus (for sale recently) are not mentioned. Let us not forget that this is an unofficial preliminary list and it is likely that other devices are added soon when Xiaomi officially announced MIUI 9 (although everyone expected the oblivion of Xiaomi Redmi 3 Pro). As for the release date, rumors suggest that the beta ROM may be available around December this year or January next year. As many of you recall, Android 7.0 Nougat adds new features like multi-window, direct replies from the notifications panel, greater additional energy savings, Google Assistant, a new virtual reality interface (Daydream VR), monthly security updates, the possibility to do more zoom on the screen, greater protection of personal data and many more. All this without counting the innovations that can bring Xiaomi custom interface. We hope to know all these developments and elected devices in the coming weeks, and the Chinese company not keep its customers in the dark about which devices will get the new update to Nougat.